AT&T, the largest mobile carrier Stateside has just announced that their partnership with LG has resulted in the availability of the LG Vu Plus, which is the latest AT&T Mobile TV-capable device that ought to keep you entertained on the go without having to miss your favorite TV program. Perfect for folks who do not like mobile gaming on a Nintendo DS or Sony PSP, the LG Vu Plus is clearly the handset for mobile couch potatoes. Available online and in AT&T stores nationwide from June 6th onwards, the LG Vu Plus will be an AT&T exclusive, where it will play nice with AT&T’s High Speed Packet Access (HSPA) 7.2 Mbps technology that is capable to deliver a considerable speed boost to the nation’s fastest 3G network. Want to know more about what the LG Vu Plus offers? Read on after the jump. You get a generous touchscreen display alongside a 4-line QWERTY keyboard that allows you to send out all those text messages and emails in a flurry without missing a beat, while taking full advantage of the ease-of-use that a touchscreen display offers. Not only that, an enhanced user interface ensures that you won’t have a tough time figuring out what goes where, while with the availability of AT&T Social Net, the LG Vu Plus is able to offer customers easy access to a world of entertainment and multimedia with just a tap of a finger. You will be pleased to know that watching full-length broadcast shows is possible with AT&T Mobile TV, although there is the small matter of forking out an additional $9.99 monthly, where the benefits include round-the-clock access to full-length live and time-shifted programming from FLO TV. Of course, to sweeten the deal, new subscribers will receive the first seven days of their subscription for free. 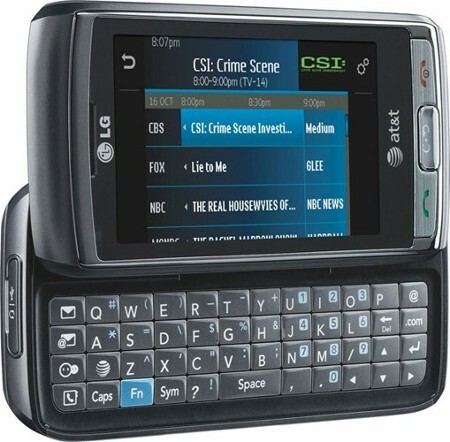 Other services supported by the LG Vu Plus include AT&T Mobile Browser, AT&T Navigator and AT&T Social Net. You can bring home the LG Vu Plus this June 6th for $149.99 after a $50 rebate, where it will be accompanied by the standard 2-year service agreement. Like I really want to watch television on such a tiny screen… Seriously! We have given too much technology to phones and just causing more problems than solving. A phone just work ONLY as a phone and nothing else. People have been using cellphone for decades without problems till they came out with texting, web browsing and so on… Now you can’t see a single dam driver on the road with texting while driving or just staring at their phone like a zombie. I bet if it had technology to ONLY be used to call out, people wouldn’t bother using them while driving. I recall having a DVD player in front seat is illegal. Than what the fu** you think a television set in your hand should also be illegal- yes or no?